ABOVE: The Nationaltheater's façade and main entrance on Max-Joseph-Platz. INSET BELOW: Tours begin at the back of the building, across the street from the daytime box office. 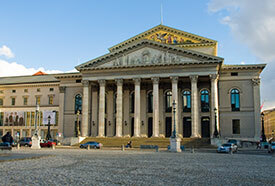 The National Theatre (Nationaltheater in German) has been the home of the Bavarian State Opera since 1818. Over the years, the 2,101-seat opera house has been rebuilt twice: in 1823, after a fire destroyed the interior, and again from 1957 to 1963 to repair extensive damage from World War II bombing. It's the largest opera house in Germany (a country with at least 80 opera houses) , and it presents a busy schedule of opera performances, ballets, and concerts throughout the year. The Nationaltheater offers guided tours at 2 p.m. on most days, depending on the opera's schedule, and the tours are worth your time if you're a theatre buff or opera fan. The price was a modest €5 the last time we checked, and you can buy tickets in the Opera Shop of the daytime box office (which is in a glass building on Marstallplatz, across the street from the tour entrance in the back of the Nationaltheater). Although the tours are in German, most guides speak at least some English, so you can ask questions as you and your fellow tourgoers move from place to place within the opera house. And for the most part, the tour is visual: You'll see areas such as the auditorium, foyers, the stagehouse, a dressing room, and the labyrinthine network of corridors that are used by singers, musicians, costumers, stagehands, electricians, and other members of the opera company and theatre staff. Tip: Buy your ticket before the tour, and be at the back entrance of the Nationaltheater (see inset photo above) a few minutes before the 2 p.m. tour departure. Once the tour begins, you won't be able to get into the theatre. For more information on guided tours, see the Bayerische Staatsoper's English-language tours page. The opera's Web site also has a Virtual Tour (complete with 360º panoramic photos) and a history of the Nationaltheater.